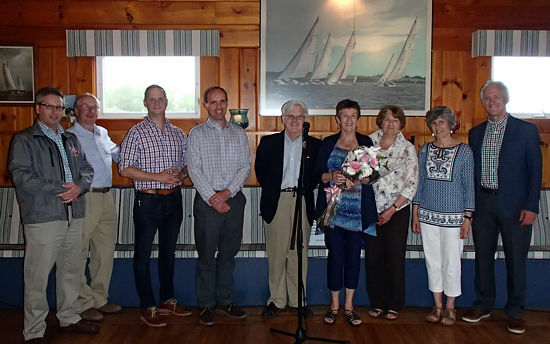 The Annual General Meeting was held on June 6 at the Lunenburg Yacht Club. Subsequent to the AGM a presentation was made by Craig Smith, Nova Scotia Program Director, Nature Conservancy of Canada. Craig spoke about NCC's goals and activities and how they relate to MICA'S, which was particularly relevant in consideration of the recent acquisition of Quaker, Lynch and Snake Islands by NCC with financial support from MICA. MICA Directors also presented outgoing Director and Treasurer Sherry Swinamer a Certificate of Appreciation for her long time exceptional work and service to MICA. The new MICA board of directors thank long-time board member, Sherry Swinamer. Dated May 18, 2017 on behalf of the board of directors. Subsequent to the AGM a presentation was made by Craig Smith, Nova Scotia Program Director, Nature Conservancy of Canada. Craig spoke about NCC's goals and activities and how they relate to MICA'S. "The Nature Conservancy of Canada (NCC) protects areas of natural diversity for their intrinsic value and for the benefit of our children and grandchildren." MICA was very pleased to have contributed $100,000 for the recent acquisition of Snake, Lynch and Quaker Islands by Nature Conservancy of Canada. These islands will now be conserved and available for traditional public access. MICA and NCC will have a joint Stewardship Agreement for the ongoing protection of these important islands in Mahone Bay. Membership dues can be paid at the AGM. Please notify us if you have a new email address so we can update our records.